I want to thank HarperTeen for supplying me with a copy of this book to read and give an honest review. Receiving this book for free has in no way altered my opinion or review. If you have not read the first book in this series, then you need to stop here if you don't want spoilers from book one. I cannot promise they will not happen. Plus, you really need the background of book one to understand anything that happens in this book. So go read it, because you won't be disappointed! I will say that this review is very hard to write without giving too much away, so I'm going to be very broad in my review. Polaris picks up very soon after Avalon ends. Jeth and his team of misfit pirates are together after their battle with Hammer and his crew. They've overcome great odds to continue their search for Empyria and the Pyreans. Of course this search does not come without it's obstacles, the biggest of which is an ITA tyrant named Saar who is hell bent on making sure Jeth and his sister Cora never remain free. Saar's reach is broader than Jeth could have ever imagined, and escape from the clutches of the ITA seems near impossible. Jeth and his crew are plotting ways to save Jeth's mother so that he can re-unite his family. But in the process, they are pulled into yet another mission where their lives are put on the line. With nowhere else to run, Jeth is forced into a fragile relationship with the untrustworthy Dax, who now has all of Hammer's power in the palm of his hand. We meet a few new characters in this book, who have their own agenda when it comes to the deals they have made with Jeth's enemies. Their background and agenda gives the story a good plot twist. Jeth goes through great struggle in this book. There is such a weight put on his shoulders, it's impossible not to feel it's heaviness press down on you as you experience his pain. But you will cheer him on, hoping beyond hope that he can overcome what shadows him, hoping he has the strength to fight and win. Arnett keeps you on the edge of your seat throughout this entire book. The characters are never at peace for long periods of time, always fighting for their lives and in some cases losing. The story is filled with non-stop action and adventure. Arnett does manage to infuse some romance into the book, but it's really secondary to everything else that happens. So if you're looking for they typical teen drama and steam that comes with YA, then you will be unhappy. But I think this is what makes this book so great. Arnett does not rely on the romance to carry the characters through the story. The story is really about fighting evil and trying to come out on the other side unharmed. 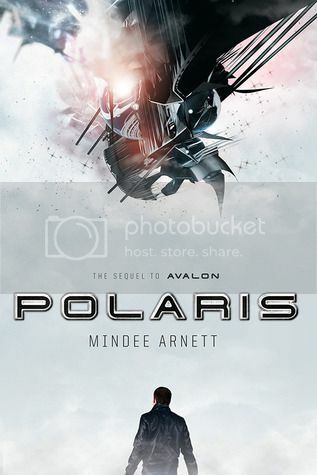 With vivid imagery and a knack for putting her characters in the most dire of situations, Polaris takes you on a ride from one end of the galaxy to the other, and then beyond. Arnett manages to keep the sci-fi well intact while making it simple enough for the average reader to understand without a lot of confusing scientific jargon. A fantastic conclusion to this wonderful sci-fi duology. I can certainly see the possibility of possible spin offs from this series and wouldn't mind having it happen in the future!